Chirk 3.5 miles. An large and spacious, detached barn conversion in the Welsh Borders, just 10 miles from Llangollen, in a lovely quiet location surrounded by some beautiful views over the Shropshire countryside. Luxuriously decorated and furnished throughout, providing spacious living accommodation and four lovely bedrooms, this Shropshire barn is just perfect for large groups of friends or extended families to enjoy some time together. This wonderful contemporary barn in Shropshire offers character and some real home-from-home touches, including stone floors, beams, feature windows, underfloor heating, a double-sided wood burner and a lovely large sitting room. The large garden to the front of this barn in Shropshire has an assortment of fruit and walnut trees, and views over the countryside, as well as two patio areas to follow the sun. Close by is the pretty market town of Ellesmere with its attractive buildings dotted between 9 beautiful meres and the well-known Shropshire to Llangollen Canal, in an area renowned as Shopshire's Lakeland. Just 10 miles away is Llangollen, with a dramatic mountain backdrop and boulder-strewn River Dee as the setting for this pretty tourist town, internationally famous for its Musical Eisteddfod. A little further afield from this Shropshire cottage is the Roman city of Chester with racecourse, zoo and a huge array of history, not forgetting its numerous shops, bars and restaurants. This is just the perfect cottage in Shropshire for exploring Shropshire, Cheshire and North Wales to enjoy at any time of the year. internet is available and free but can be slow at times. We are glad you enjoyed your stay and hope you visit us again sometime. Great having you as guest. Great holiday for a large multi generational family. Peaceful setting, great garden for children to play and lots of room indoors. Owner very helpful with pre information and sent useful reminder on rubbish collection day. The barn was well furnished and equipped with extras such as dvds, toys, books, Netflix etc. Lovely half term break. Recommend highly. Great house with lovely indoor and outdoor space and room for 3 cars. Well positioned only 5 mins from a main road and supermarket but felt miles from anywhere. Walked 5 miles from a nearby village and didn’t see a car. Warm and cosy inside with everything you could possibly need and a chance to try a water bed for the first time! Fantastic place in a lovely location, the barn has everything you could possibly need for your stay. The whole family went to celebrate my husband 60th birthday we had a fantastic time at the barn, the grandchildren enjoyed the garden and had great fun kicking a ball around and playing with all the games that are provided. 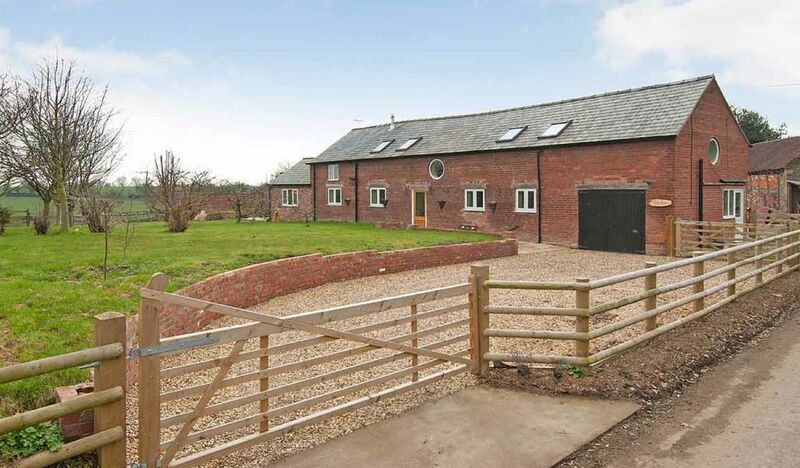 The barn is in a lovely location with very rural views. The barn has everything you could possibly need while away from home I think they have thought of everything, would definitely recommend the only thing we weren't too keen on was the water bed but the youngsters slept in it. Overall our stay at The Barn met with our expectations, even if the weather didn't! I don't think that repeating the generally positive reviews of other guests archives a great deal, but I would like to comment on location and cleanliness. A car is absolutely essential if staying here since the nearest village is 2 miles away along winding, unlit country lanes that would be hazardous to walk along at night. The nearest pub is The Keys, which is located in the centre of the village and cannot be rated highly enough. Concerning cleanliness, a previous visitor commented on the fact that the building, especially the kitchen, needed a deep clean. We would echo this opinion up to a point. It is not as though it is major problem, more the fact that the contract cleaners cannot adequately clean a large building such as this in a five hour change over period whilst attending to the more time consuming tasks. No doubt the owners will read this, so our suggestion is that the oven and microwave are specifically included in the cleaning schedule. Half a mile from the Welsh border. Excellent walking. The change over day for full weeks is Saturday. Winter short breaks can vary by agreement. For short breaks of more than three days extra days will be pro rata of the weekly rate, total cost of a short break will not exceed the weekly rate for that period.